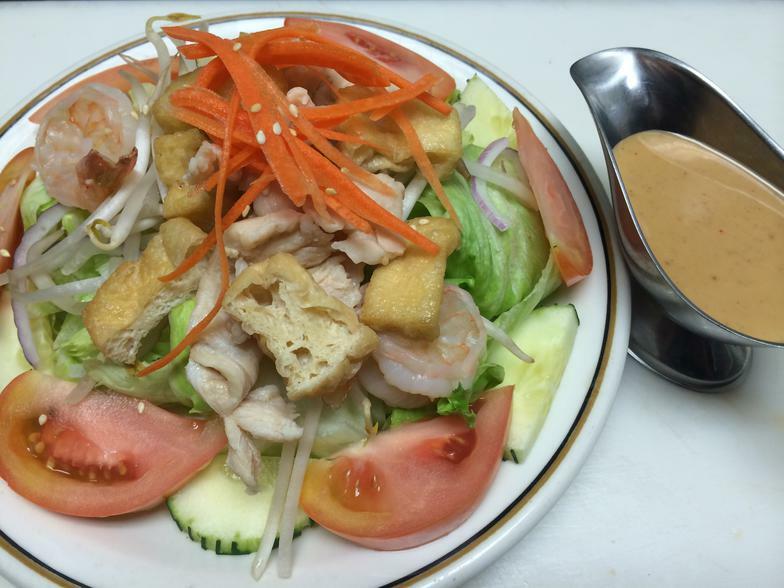 Shrimp, chicken, tofu on a bed of fresh vegetable serve with Thai salad dressing. with red onion, cucumber, carrot, scallion in Thai lime sauce on a bed of fresh lettuce serve with steamed rice. Ground meat with red onion, scallion in Thai lime sauce, ground roasted rice on a bed of lettuce serve with steamed rice. Shrimp, chicken, bean thread mixed with red onion, scallion in Thai lime sauce on bed of fresh lettuce serve with steamed rice. Meat with red curry paste in coconut milk and whole milk with string bean, green pepper, and bamboo shoots. Meat with green curry paste in coconut milk and whole milk with green pepper, eggplant, bamboo shoots, carrot, and string bean and basil. Meat with yellow curry paste in coconut milk and whole milk with green pepper, onion, pineapple, and, tomato. Meat with masaman curry paste in coconut milk and whole milk with potato, onion, pineapple sweet pea, and peanuts. Meat with panang curry paste in coconut milk and whole milk with green pepper, red pepper, sweet peas, and boccoli.